• PLOT SUMMARY: Brightest Day Tie-in - Exploding out of BLACKEST NIGHT comes the next exciting chapter in the Green Lantern mythos: 'New Guardians'! 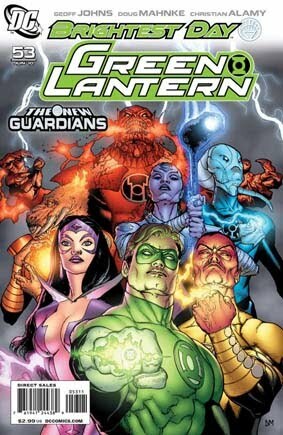 Forced together during the rise of the Black Lanterns, Hal Jordan, Sinestro, Carol Ferris, Saint Walker, Atrocitus, Indigo-1 and Larfleeze must agree to disagree if their next mission is to succeed. But when one of the strangest beings from Green Lantern's past returns, the future of the Lanterns and the universe at large once again falls into question. Written by GEOFF JOHNS. Art by DOUG MAHNKE and CHRISTIAN ALAMY. Cover by DOUG MAHNKE.